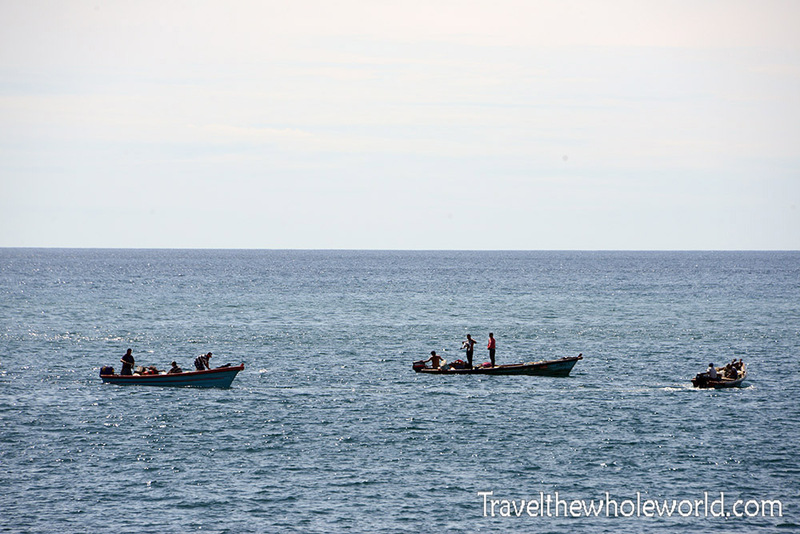 The most important experience I missed out on in El Salvador was visiting its famous beaches. As a matter of fact, El Salvador is considered by many to be one of the best places in the world for surfing. With tropical waters and good surfing conditions nine months of the year it;s hard to beat. A local told me a story about how the star member of Fast & the Furious had visited El Salvador to go surfing. No one recognized him so he was just another tourist who wrote his name on a wall in his hostel. Eventually the hostel owner remodeled the place and painted over his name. Sometime later after founding out who he was and what she had done she had a nervous breakdown! 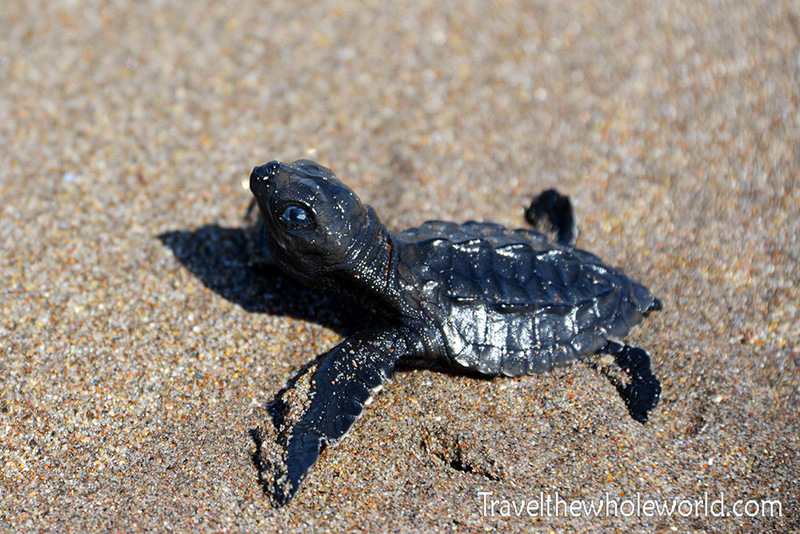 My main reason for visiting La Libertad was to see the nearby turtle conservation. I had considered going scuba diving on this trip in the eastern part of the country but ended up doing other things. 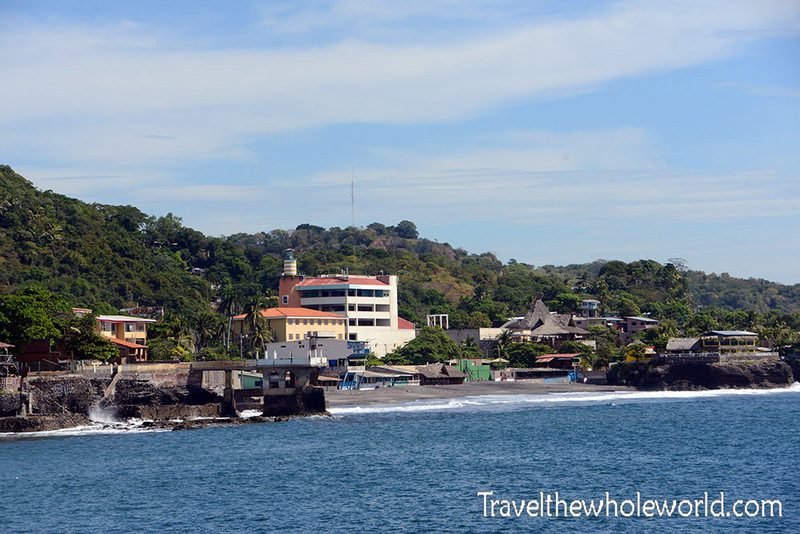 The photo above shows the seaside town of La Libertad. It looks like a beautiful and peaceful place. It wasn’t until I left El Salvador that I discovered La Libertad was one of four locations in the country where the majority of murders happen. 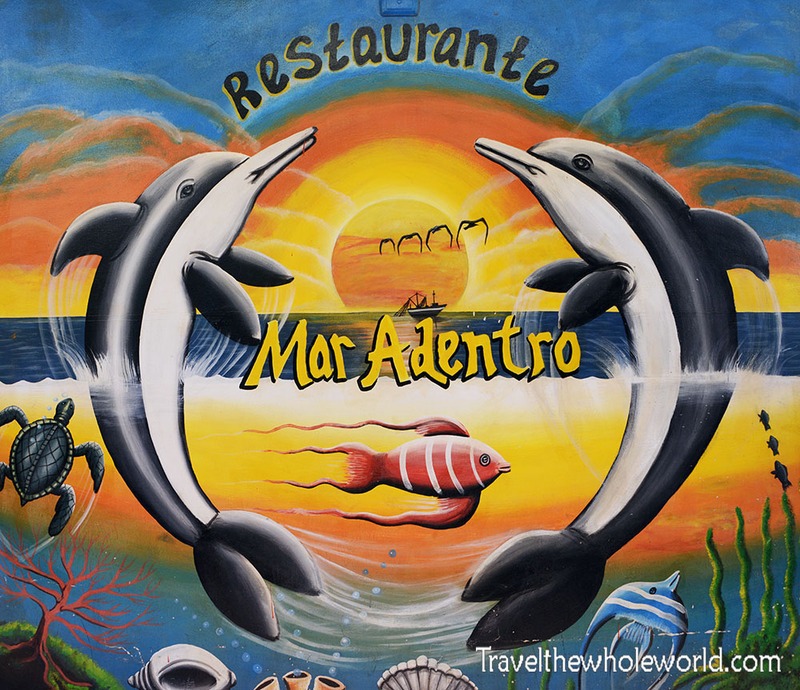 Since I’m not a fan of seafood, La Libertad wasn’t as exciting to me as it might be for others. 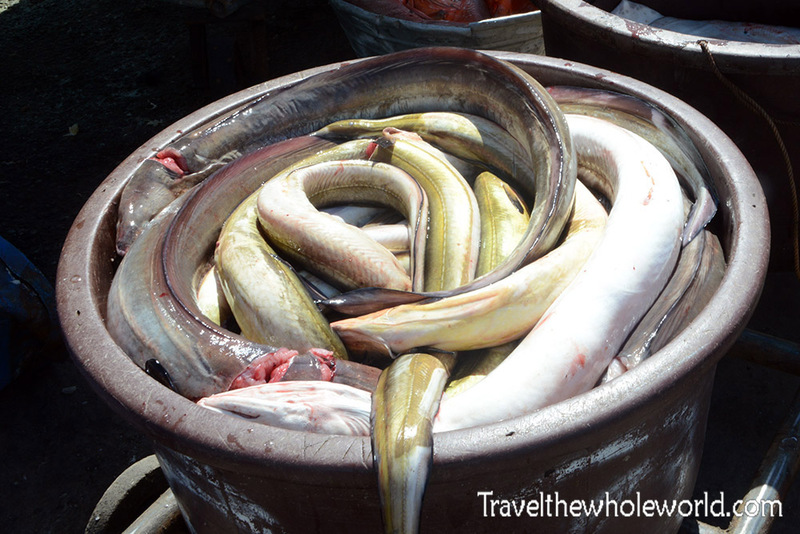 There are several high class seafood restaurants along the waterfront. I was surprised by how fancy they were. One was even designed to look like a colonial ship. The photo above shows an advertisement for one of the restaurants. One of the most amazing recent maritime stories took place in El Salvador actually. 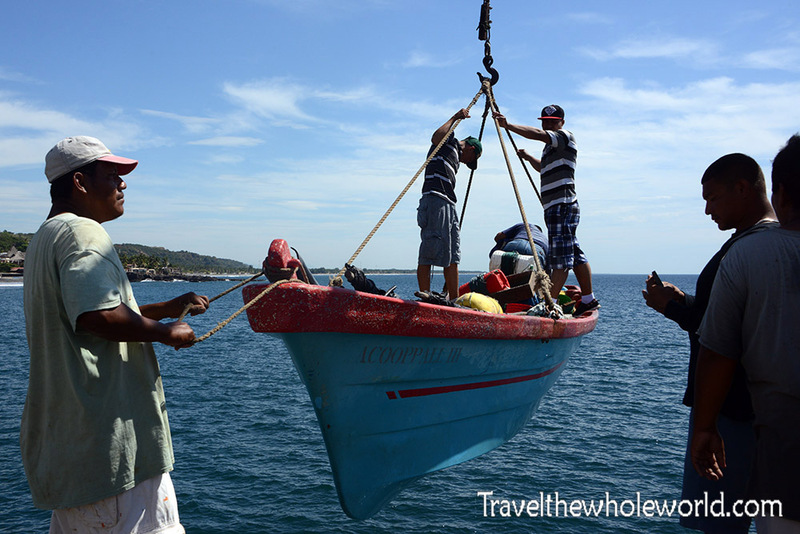 A few years before I visited El Salvador, fisherman like these guys above ended up stranded in their boat. While you’d figure they’d spend a day in the boat before being spotted with so much shipping in the area, that wasn’t the case. The story had a tragedy to it as one of the men did not survive. The other man, Salvador Alvarenga, was able to make by surviving on rainwater and eating raw fish and birds that landed in his boat. Incredibly he did this for over a year. By the time he was rescued, he was found off the coast of the Marshall islands on the other side of the world. He had drifted for thousands of miles and made it to Oceania. To put things in perspective, if he had gone the same distance directly south he would have washed up on the shores of Antarctica! 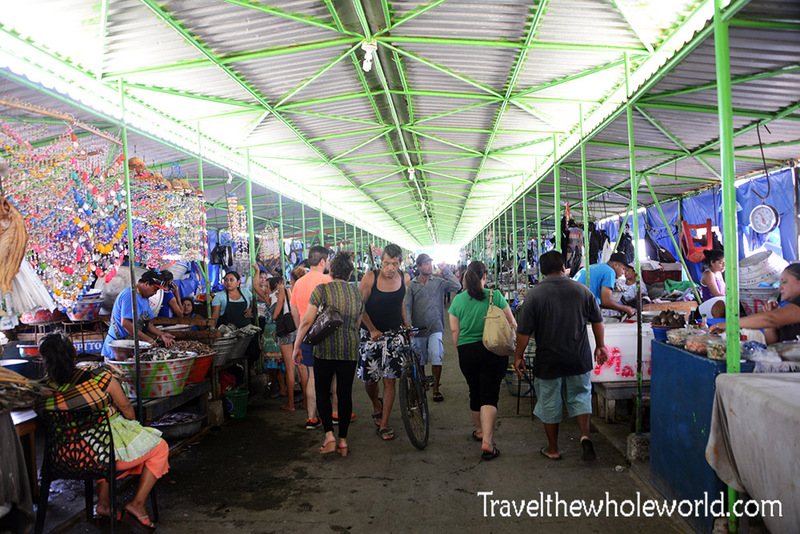 My most interesting experience in La Libertad was visiting the wharf. There was a guy here about my age who looked like someone you shouldn’t mess with working the docks. He saw my camera and gave me some info on the area. A few days ago when I was in El Salvador there had been a 7.2 magnitude earthquake, and he said this scared all the fish away. He was a really nice guy and spoke perfect English, so he most definitely lived in the United States for a while. Above is a photo of a boat being hoisted out of the ocean. 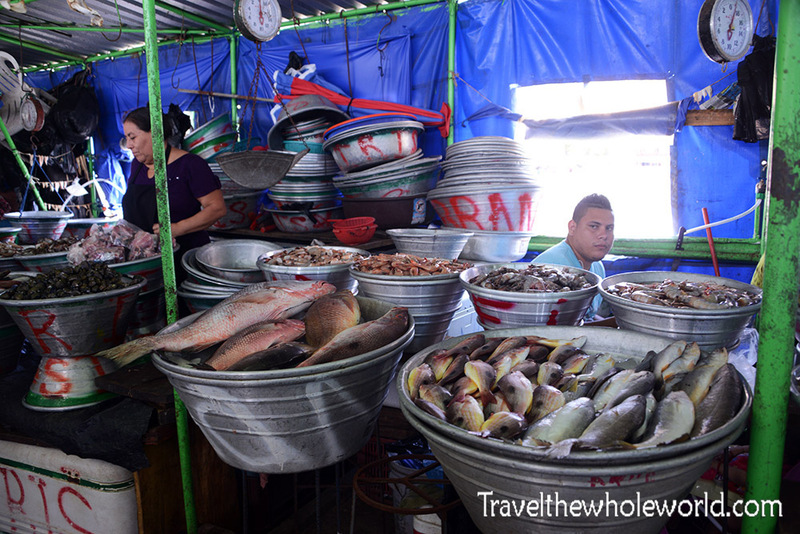 The fish market along the wharf was packed with people and all sorts of horrible smells. I realize the vast majority of people love seafood but it’s not for me! Seriously though, how can that bucket below look appealing to anyone. Above and below are some more photos of the fish market. 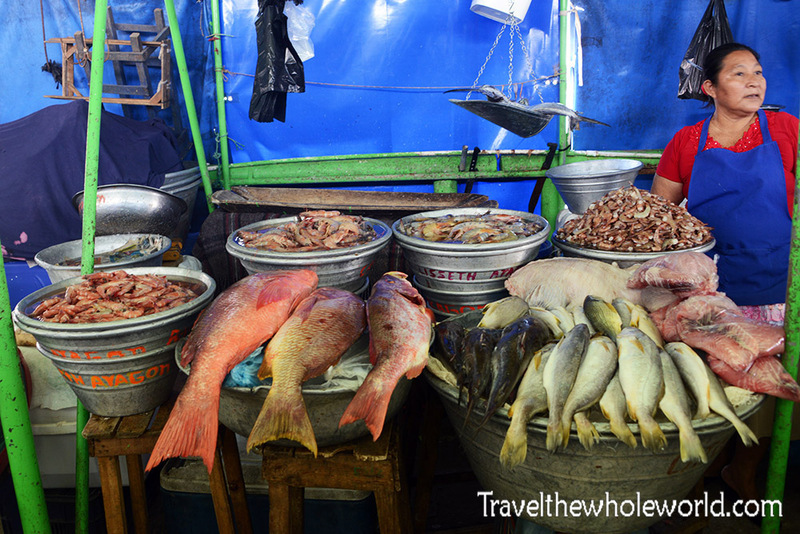 You can see there is a huge variety of fish here. Whenever I see markets with so much stock I always wonder how they sell it all before it expires. A few stands here sold souvenirs made out of colorful seashells glued together. I rarely buy souvenirs and considered purchasing one, but didn’t think it’d survive the journey home. La Libertad is directly on the ocean of course, but to visit the turtle conservation you’ll have to drive about 20 minutes to another location on the beach. The beach itself here wasn’t too spectacular. 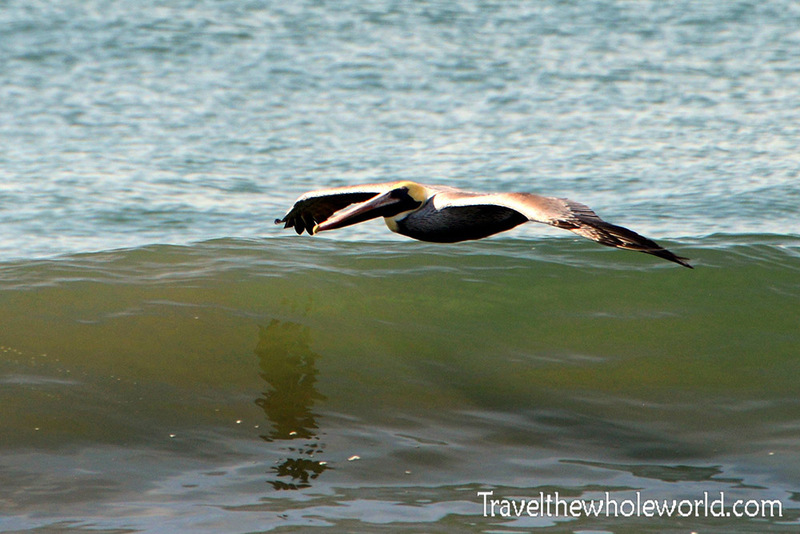 It had some typical wildlife like crabs running around and several pelicans. The sandy portion of the beach was only a few dozen feet and I saw no one swimming. This is what I came to see. 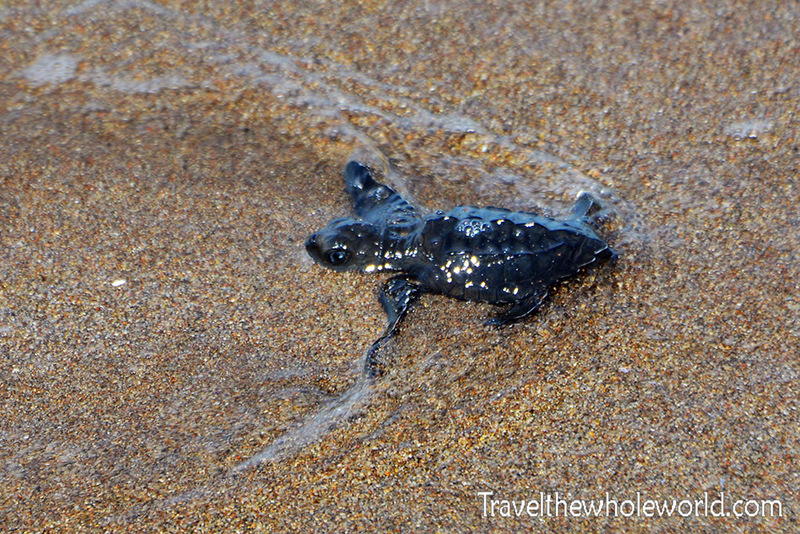 The conservation here does an amazing effort at protecting and releasing baby sea turtles. 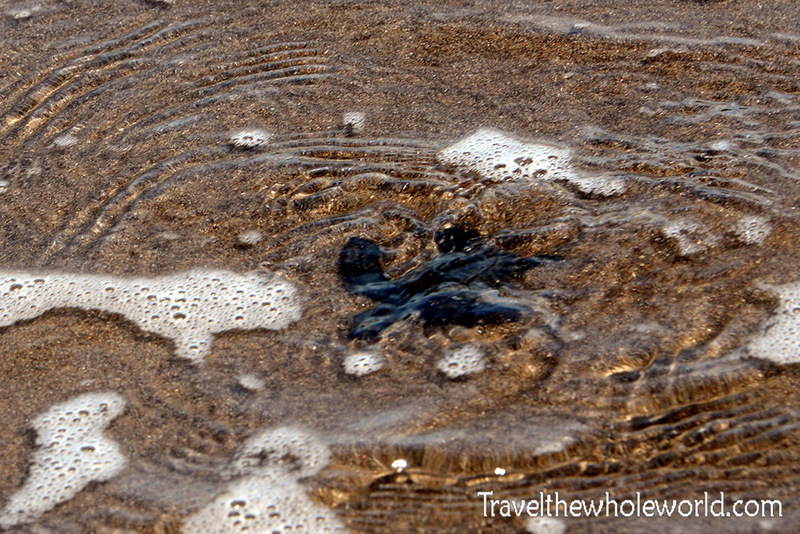 The species of sea turtle here is the Olive Ridley. The Olive Ridley is the least threatened of all sea turtles but is still endangered. They conservation protects all sea turtles they encounter, but said this year they did not see any other species such as the critically endangered Leatherbacks. When the sea turtles lay their eggs, they are collected by the conservationists and buried in an enclosed area. When unprotected only an incredibly small amount of sea turtles survive the incubation period. Their numbers are little as only 1%! When protected on the other hand, as many as 70% will survive. After hatching they are on their own. If these sea turtles are lucky, they’ll get to live as long as 50 years. They’ll spend their entire lives at sea, and with that long life these photos show their first time ever entering the ocean.